On the tube back from work this evening, as the District Line train passed over the Thames near Kew, I noticed a man by the door reading The Black Swan. 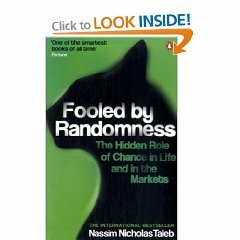 A splendid book, although I think Nassim Nicholas Taleb’s previous book, Fooled by Randomness, is better. At the time I was listening to Start the Week, with the Argentine mathematician Graciela Chichilinsky explaining what doofuses we are when it comes to dealing with catastrophic risk. 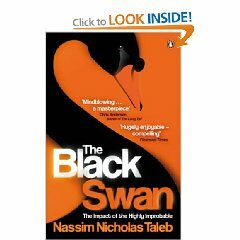 This includes Black Swans, low-probability high-impact events so unexpected that they go against all empirical knowledge held beforehand. As Rumsfeld might say, they’re unknown unknowns (by the way, despite the ignorant sniggers that accompanied it, that was an extraordinarily well crafted speech). I haven’t time to recount more, as I’m off for a pizza and glass of wine, but the key thing is that Chichilinsky seemed something of an expert in constructing systems to deal with catastrophic risk, to allow mere humans to vault over our limitations, indeed harnessing those limitations to that end. An example was the creation of carbon trading schemes to deal with aspects of climate change. As an economist (which I’m not) I’d talk about choice architecture, market failure, the tragedy of the commons and externalities. As Mr Monkeysized (which I am) I’ll instead talk about this being a fabulous way for over-evolved but under-developed apes to cope with what they otherwise can’t. Nice one, Chichilinsky, the Order of Monkeysizing awaits your collection, next time you pass my way.